It stands to reason that selling options with a high option premium will generate the most income. But which stocks have the highest option premium? And what exactly defines an option premium? As of this writing, the list of stocks with the highest option premium includes Mercadolibre, Netflix, Tesla, Shopify, Alibaba, and others. An option premium is the intrinsic value plus the time value of the option. Another term for the option premium is simply the option price. While selling options with the highest premium provides the most income per option sold, it is not always the best strategy for maximizing overall income from options trading. Option premiums change every second, so we can’t make an evergreen list. But what we can do is point you to a list that updates every day. Here is the Barchart.com list of options with highest implied volatility (IV), sorted by price. Since the price of an option is the same as its premium, this list provides options with the highest premiums. These stocks have the highest option premiums. Because of this, they could be an excellent source of income for option sellers. But selling these options could also be a big mistake. In order to understand why, let’s consider what an option premium is. The option premium is the intrinsic value plus the time value of an option. Here is what each of these terms mean. The intrinsic value of a stock option is the difference between the underlying stock’s price and the option’s strike price. In the case of a call option, the strike price is subtracted from the underlying stock’s price to derive the intrinsic value. In the case of a put option, the opposite is done: the underlying stock’s price is subtracted from the strike price to derive the intrinsic value. 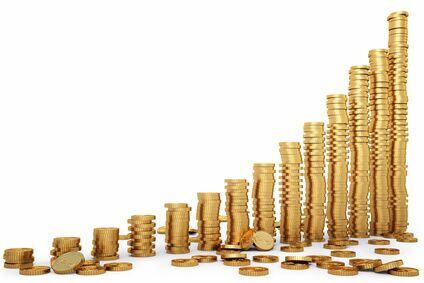 Intrinsic value measures the benefit that would be gained by the owner of the option if he were to exercise it. For example, if a call option for ABC Corp has a strike price of $100 and ABC Corp. stock is currently trading for $150, the option’s intrinsic value is $150 – $100 = $50. In other words, if you own this option and want to buy a share of ABC Corp., you can use this option to save $50 on your purchase. The intrinsic value for a put option works similarly. If a put option for ABC Corp. has a strike price of $200 and the stock is currently trading for $150, the intrinsic value is $200 – $150 = $50. In this case, if you own a share of ABC Corp. and want to sell it, you can make an extra $50 by exercising the option instead of selling the stock to a random person. 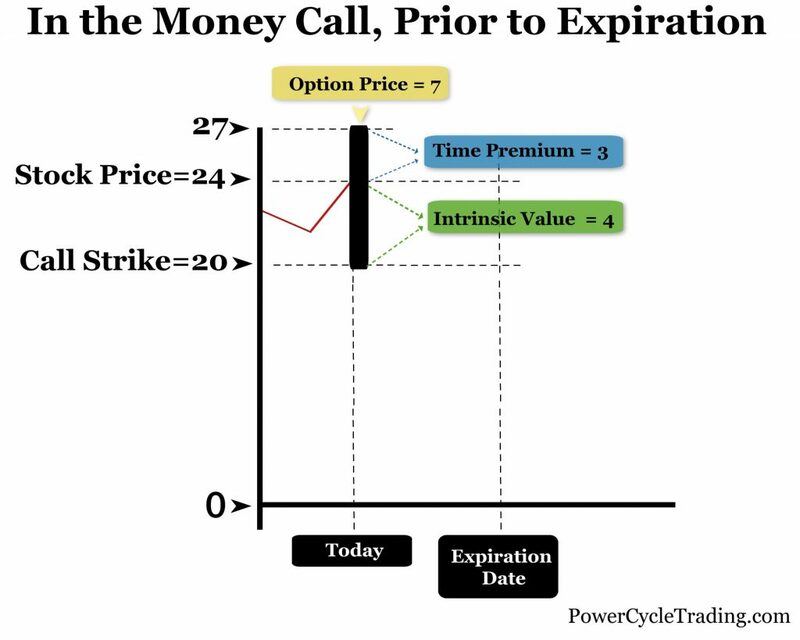 If a call option has a strike price above the current price or a put option has a strike price below the current price, the option has no intrinsic value. This is called an out-of-the-money option. If the owner of an out-of-the-money option exercises it, he will either pay more when buying the stock or make less when selling it. This is generally not what the owner wants, so options that are way out-of-the-money are considered to have an intrinsic value of zero. We might expect the price of an option to be equal to its intrinsic value. But that isn’t what usually happens. In most cases, options cost more than their intrinsic value. 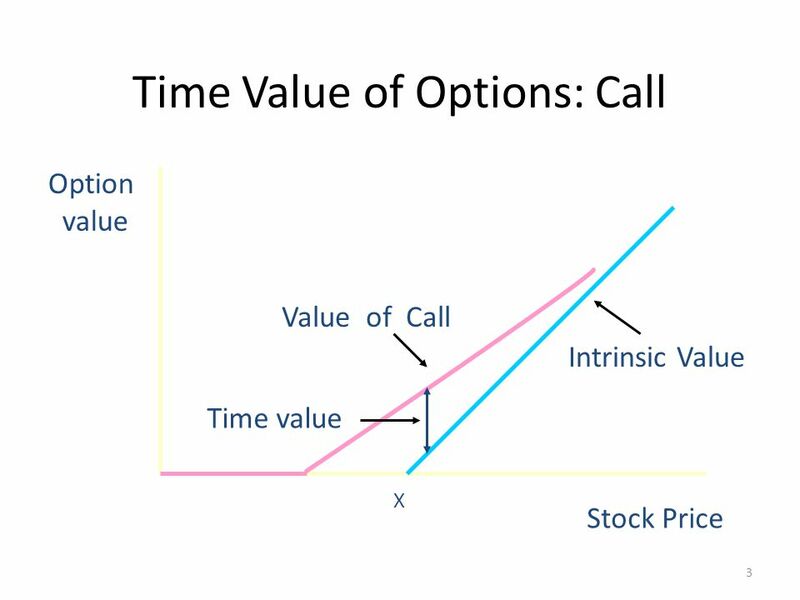 This difference between the price of the option and its intrinsic value is called its time value. For example, let’s say that a call option on ABC Corp. has a strike price of $100 and the price of a share is $150. In this case, the intrinsic value is $50. But let’s say the option is selling for $55. This means that it would cost $5 more to buy the option and exercise it than it would to just buy the stock outright. This extra $5 is the cost of holding the option for the period of time until the option expires. Because of this time element, this cost is called the time value. Now that we’ve considered what the intrinsic value and time value of an option are, we can easily explain what an option premium is. An option premium is simply the time value plus the intrinsic value of an option. In other words, the option premium is the option price. Should you sell options with the highest premium? It could be a good idea to sell options with the highest premium. Again, if an option has a higher price, you can make more money per option sold. But whether you want to sell options with high premiums depends on a few things. First, keep in mind that selling an option brings with it an obligation. If you sell a call option, you agree to sell the underlying stock at the strike price even if its price later rises. If you sell a put option, you agree to buy the underlying stock at the strike price even if its price later falls. Note that an option may have a high premium because traders are being irrational. Maybe there is no good reason for the premium to be high. On the other hand, the premium may be high on a call option because there is a good chance the price will rise during the term of the option. Or it may be high on a put option because there is a good chance the price will fall during the term of the option. In other words, a stock may have a high option premium because it is more volatile than other stocks. In this case, it may be a bad idea to sell options on a stock that have a high option premium. Maybe the premium is high, but because of the high risk of the owner exercising the option, the premium is not high enough to warrant taking the risk. Your overall option trading strategy, however, will influence whether you seek out high option premiums for your trades, as explained below. Whether or not you base your trades on finding stocks with the highest option premiums can depend on your strategy. It stands to reason that if you’re primarily a buyer of options, you want to find stocks with low option premiums so you can buy them cheaper. This allows you to control stocks at a lower cost. On the other hand, if you’re primarily a seller of options, you’ll want high option premiums. Here are some common options trading strategies that would seek out stocks with high premiums since they focus mostly on income. Some also have a hedging element, which I always like to add to lower risk. If you want to learn more about advanced Butterfly Option Spreads, click here to read my article on them. Or Click Here to read my post, Options Trading 101, which explains a basic covered call strategy in more detail. Some strategies focus on buying options, such as the ones below. As above, some of these strategies have hedges, so they also sell an option, but the primary focus is on buying, or being long. A lot of investors and traders like to buy options outright because they are so much cheaper than stocks. 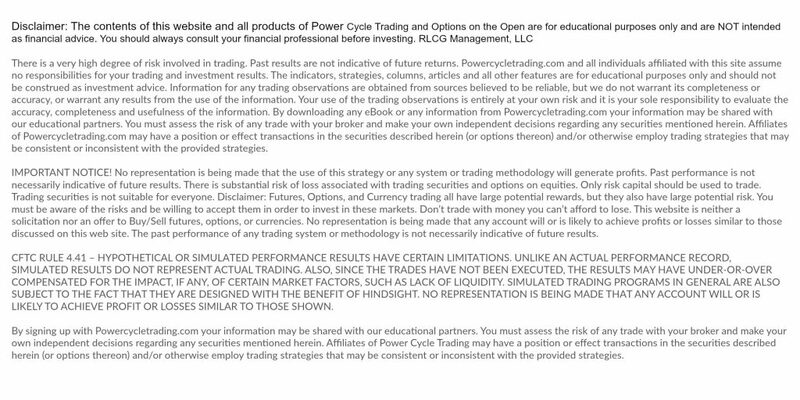 As I often warn Power Cycle Trading Club members this can be dangerous. Many investors will get their first taste of options by buying them outright. They’ll loose money not from not understanding the importance (and danger) of time decay, and swear to never ever touch options again! For example, a common scenario may be to buy options at a cost of $1 per contract (option premium) allowing you to control 100 shares of a $50 stock. In this case, buying the stocks outright would cost $5,000. Buying the options, on the other hand, would cost $100. This is one reason options are so popular but also why they get a bad reputation as being risky! Click here to read my post, Options Education, with more about buying options outright. Having explained this, I don’t like option strategies that leave the trader exposed to unlimited risk. For this reason, in my programs, I focus on strategies that allow traders to hedge since risk management is as important as profits. Click here to read my post Ways to Lower Options Trading Risk. We’ve explained which stocks have the highest option premiums, what an option premium is, and why sometimes selling the highest premium option is not a good idea. You’ve seen the option strategies that focus on selling options as well as those that focus on buying options. If you think you are interested in high option premiums, first, define your trading strategy. This will be a focus of your goal. is it income? Is it hedging? Is it both? Don’t get too caught up in the glitter of high option premiums. At Power Cycle Trading, we look at the overall market direction first, where we think the specific stock or ETF that we like is headed, and the probability a trade idea will work after we factor the option premiums into the trade setup. 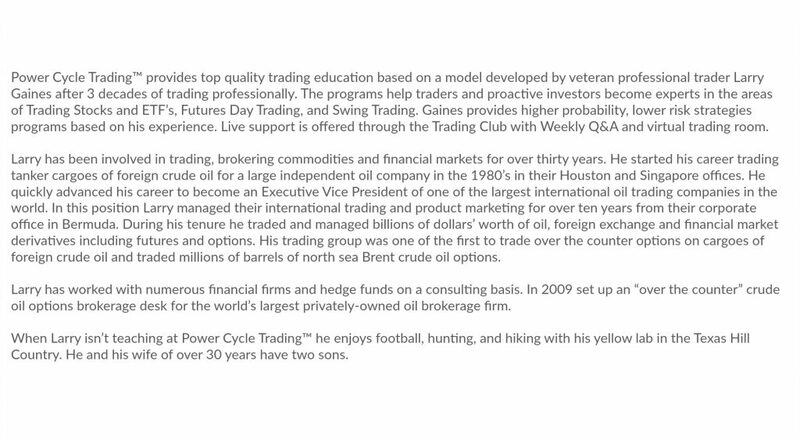 Click Here to get daily trading ideas from me in my Power Cycle Trading Club.